Are your current tyres tubed or tubeless? If tubed it would be best to replace the tubes as well. It's not a good idea to fit tubes into tubeless tyres because the latter have a rougher inside which will chafe a tube. If tubed the choice of tyre is less than tubeless. The nearest "modern" size nearest to 7.50 x 16 is 235/85 x 16. It's really a personal choice. I'm using 7.50 x 16 tubeless Goodyear G90's on Wolf wheels but I'm not sure whether standard 7.50 wheels are suitable for tubeless. Tubes are of dubious quality. The best place to get them is Vintage Tyres at Beaulieu Motor Museum. Keep us informed, maybe someone else is using tubed tyres. By the way when I was descending Hurstbourne hill at about 9am Sunday September 30th, a dark VW flashed its lights, was that you? If you see a Series 3 sporting a large poppy on its grill, that's me. I’ve got Michelin XZL’s on my Series 3 in 7.50R16. They are more an off-road that all terrain but are widely available at a reasonable price. The metric equivalent of 235/85R16 cost more for these though. If you want a more road or all terrain pattern, BF Goodrich are available in 235/85R16 and are good for 60k miles in my experience. They are good on road and not bad off road so will be perfect for green laning. I’ve got Cooper ATR’s on my 90, which are another good compromise between road use and occasional green laning. Rich, I didn't know that XZL's came in 7.50 x 16. Might be worth considering to put on my 4 spare Wolf wheels. Are they tubeless though? I used to run 7.50 XCL's on LWB rims before I got the G90's on Wolf wheels. XCL's are directional so I had 2 spares. Alan, I think they’re tubeless but google suggests they can be run with tubes too. They’re not directional so you just need the one spare. The 7.50’s are more common than the 235/85’s so you’ll have no issue finding a set. I have 7.50 X 16 Michelin XZLs on tubeless standard Land Rover steel wheels on both my Stage Ones, although all my spares are still tubed on the older tube-type wheels - the tyres can be used with tubes or tubeless on tubeless wheels. Compo81, I sent you a pm. I also have 7.50 x 16 XZL's on my 88", they are on defender tubeless rims. They are getting on a bit and starting to crack in places. So I too have been looking around and have been thinking of getting some 6.5" wolf rims and 900 x 16 Petlas, hopefully to get that 1 Ton look. They are the only make I believe (could be wrong though!) that are the same overall diameter as the old 1 Ton tyres but still almost as narrow, as unfortunately the similar diameter metric 255/100/R16 (often fobbed off as 900 x 16) are waaay too wide, look wrong at will have interference issues on turning. I think you will find that 9.00 x 16 will be overgeared with the 4 cylinder engine. The 1 tons had the 2.6 6 cylinder engine and I believe the ratios in the transfer box are different and you'll need a 1 ton speedometer. I measured the diameter of a Wolf wheel fitted with a new Goodyear G90 and it's about 30 inches. It will be more with a 9.00. I weighed one of my Wolf wheels with a G90 and it tips the scale at about 6 stone so it will be heavier with a 9.00. A 2.5 petrol has about the same power as the 2.6. Best to stick to 7.50's on Wolf wheels. Thanks for that Alan. I agree with the weight issue, 900's are around 34" tall so their weight must well exceed 6 stone. I think 1 tons also had extended spring shackles. They do have a great presence though with those tyres! 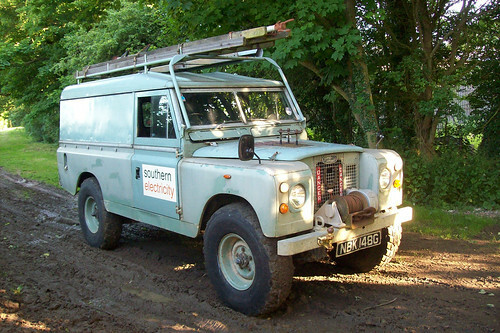 Adie, I saw the Land Rover in your picture at a local show a few years ago. It has also featured in the LR magazines a few times too. The 900’s look good but the gearing would need to be changed to compensate. I've consulted "The Bible" (James Taylor's book) and all 1 tons were fitted with the "Easy Change" transfer box which was synchro and high or low ratio could be selected while on the move. As I thought this transfer box has lower ratios to compensate. New to Landy life...but now with bleeding knuckles! 1976 series 3 109" station wagon 6 cylinder.....the one which has a drink problem! Yes. My SWB Series 3 on 7.50's and parabolic springs is noticeably taller than one on standard springs and wheels. To reach the distributor I have to stand on something otherwise it's not easy to reach over the wing. It's got side steps fitted so that Mrs. D can get in. If you do fit one ton wheels you may find it will be overgeared with the overdrive engaged and you will need a one ton speedometer and they are rare.